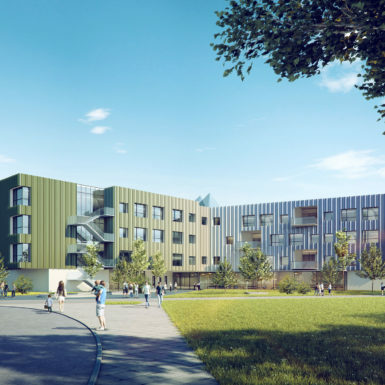 The new school for the Bürgerspitalwiese in Vienna will occupy a very specific site at the border between the North of the Simmering (11th district) and the east of Edberg (3rd district). From above the plot remains as a solitary island between the reconverted industrial area to the north and a traditional housing neighbourhood to the south. 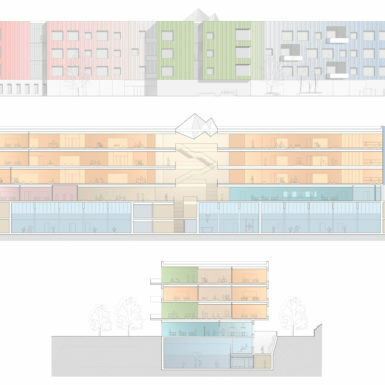 In a closer view, the triangular plot is defined by open blocks to the North and East, (office buldings and new housing blocks), and the Hyblerpark to the South and West. 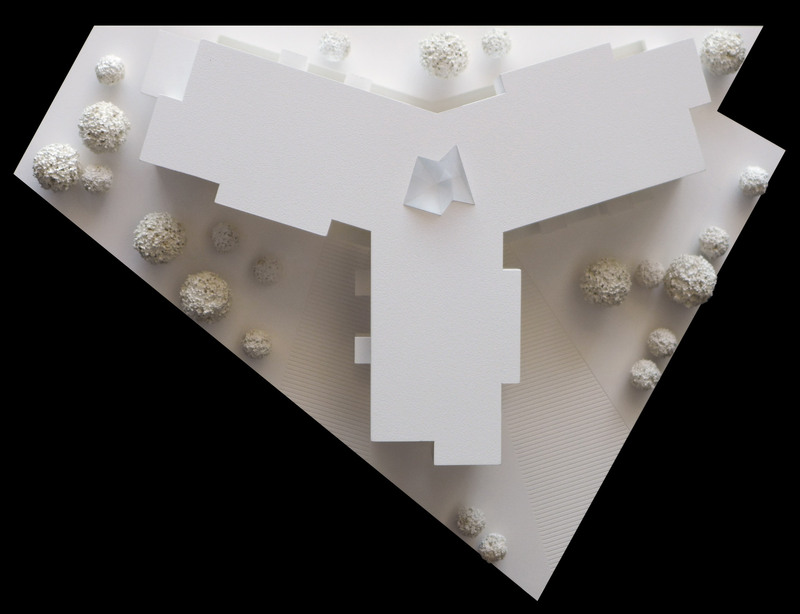 Our proposal responds to the specific context, of the surrounding open block architecture and the Hyblerpark through an autonomous bulding placed on a large green surface. 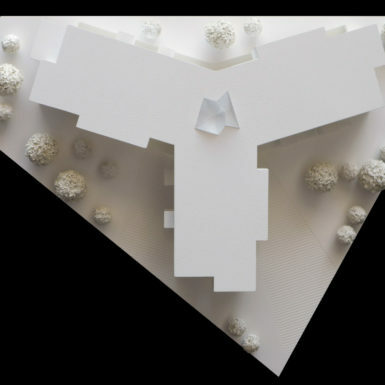 The radial form of the building allows for an extroverted volume that reaches out to the Hyblerpark. By extending the green surface inside the plot, we create a continuation between the Hyblerpark to the South and the future Zentralpark planned by the Gasometer. 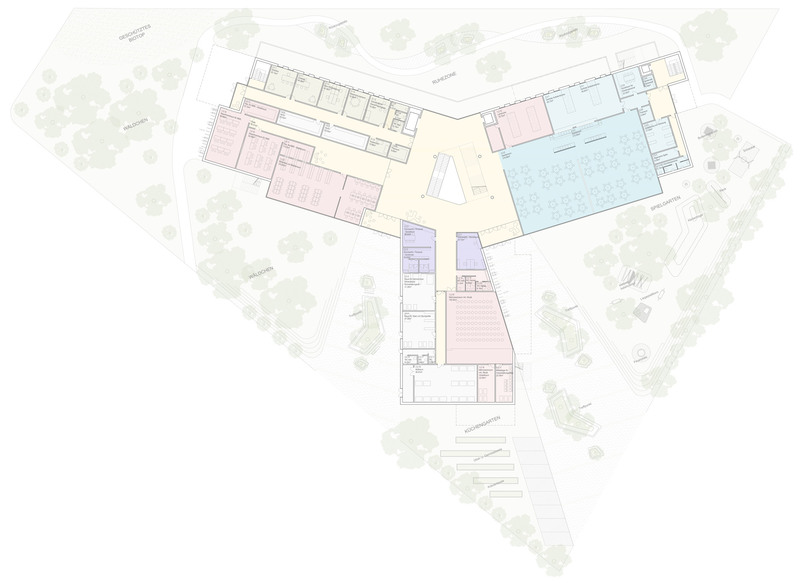 This new green surface around the future school not only enlarges the green zones of the North of Simmering but allows for visual connection for the main areas of the school (Library, dining rooms) towards the exterior green zones. 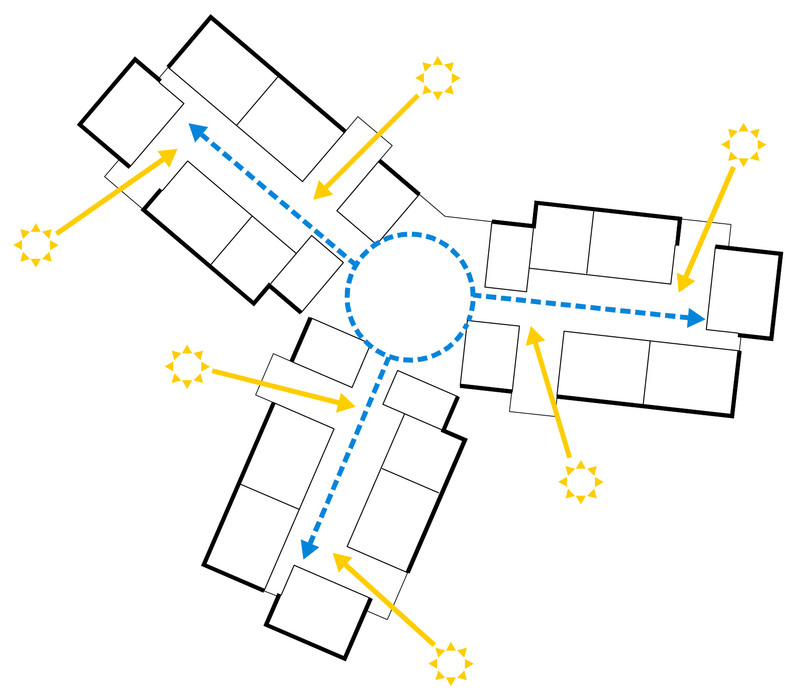 The school is accessed through 2 wide paths running along the sides of the south wing directly into the hall of the building. 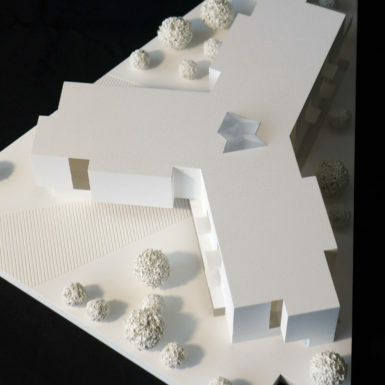 This paths are large exterior spaces including resting zones that will allow for the gathering of parents and children between the school hours. Towards the right entrance the green exterior space includes children’s playing areas and acess for delivery to the kitchen. 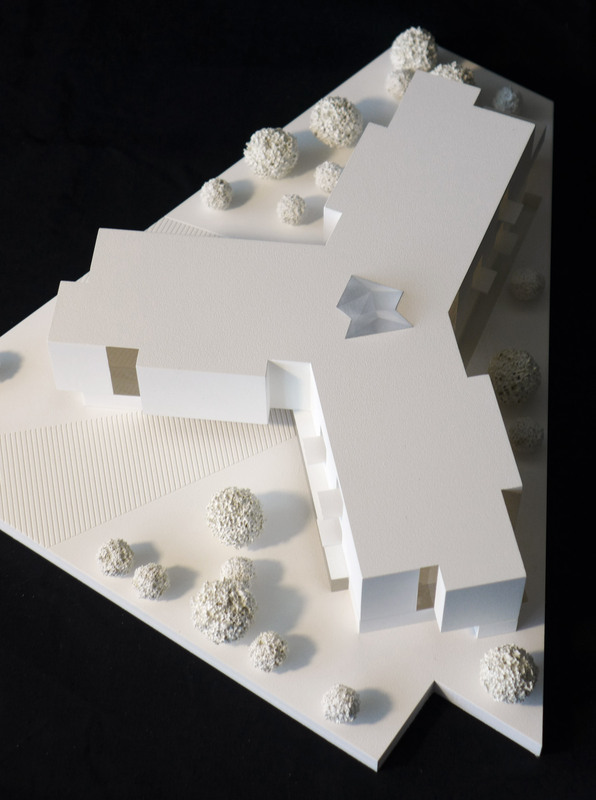 To the left entrance we designed a small forest of local trees as a continuation of the Hyblerpark that extends towards the west corner of the building; a small path allows for a private entrance to the western wing of the school. The green surface continues to the north of the plot including a quiet area with pedestrian paths and small resting areas. With all these exterior green areas, all the interior spaces will have views to the outside gardens. 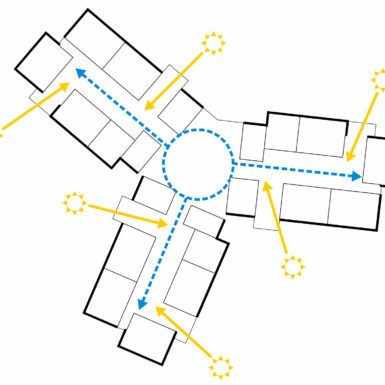 With the design of a radial form, the hall of the building becomes the hub of the building were circulation elements and meeting places for students and professors take place. The hall includes the stair to the gymnasiums located in the basement and the stairs to the student clusters located in 3 upper levels; it is of triple height and illuminated by a generous skylight. 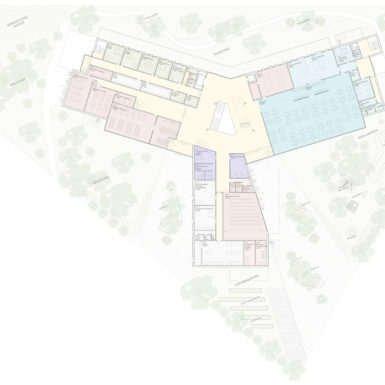 The central space dissolving in 3 linear bars suits the school program in the ground floor, dividing professors area and library in the western wing, dining halls with the complementary kitchen in the east wing, and guard, storage and meeting hall in the south wing. 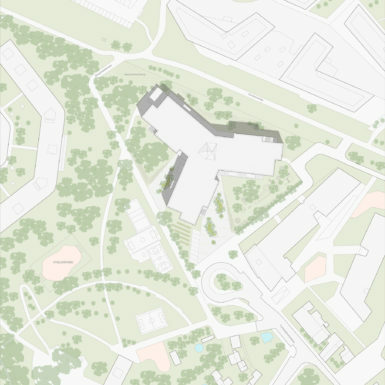 As mentioned before, all the programmatic elements of the ground floor directly face the green exterior spaces. 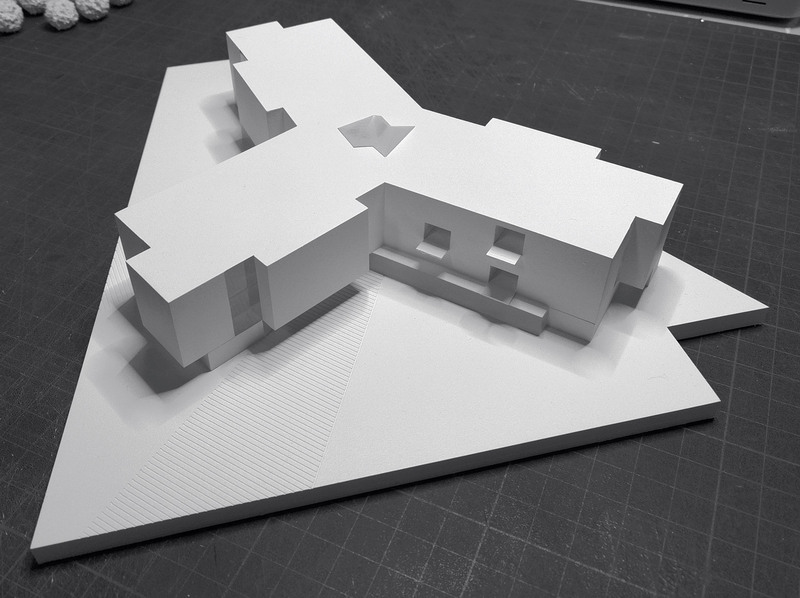 As for the upper levels, the radial form suits the program of a school divided by clusters. 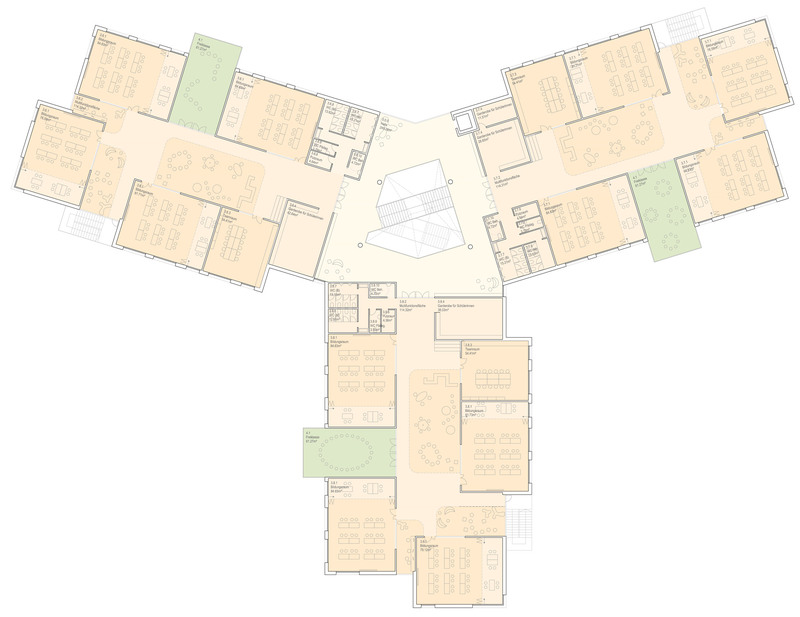 Each floor contains the central hall (with circulation and resting areas) that allows access to the different clusters located in the 3 wings. At the entrance of each cluster, bathrooms, closets are located. 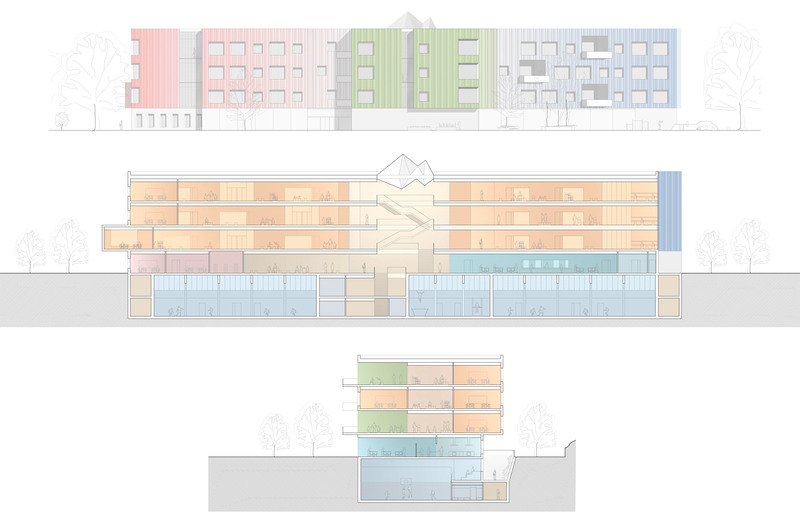 The clusters are articulated around a large central space (where the common areas are located) that distributes to the classrooms facing the exterior gardens around the site. 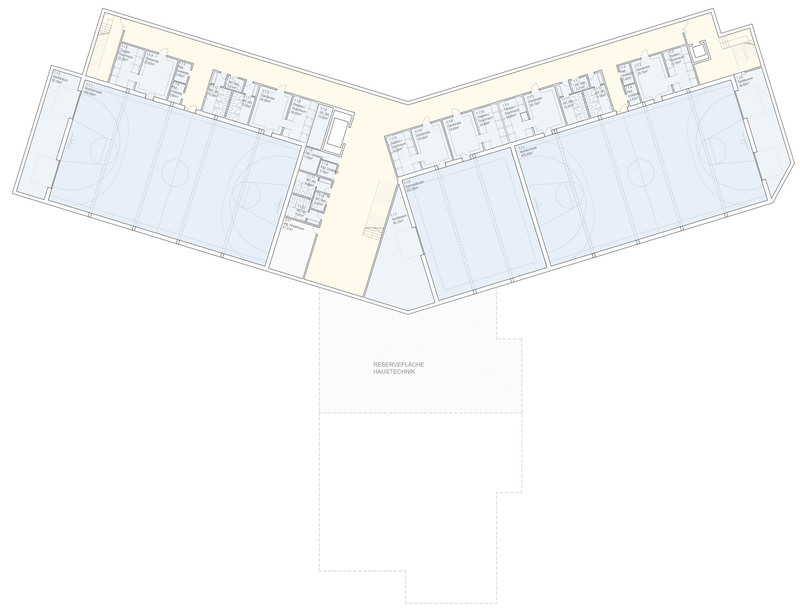 The class shared spaces between the classrooms are separated by sliding doors, and large fixed windows have been placed towards the common spaces of the central space. 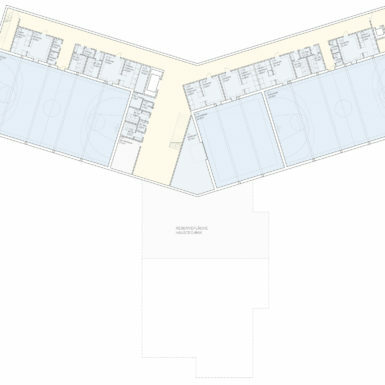 This allows for greater flexibility in 1) subdivision between groups and classes 2) class sizes, 3) the union of several groups of classrooms or 4) the formation of large groups or events. 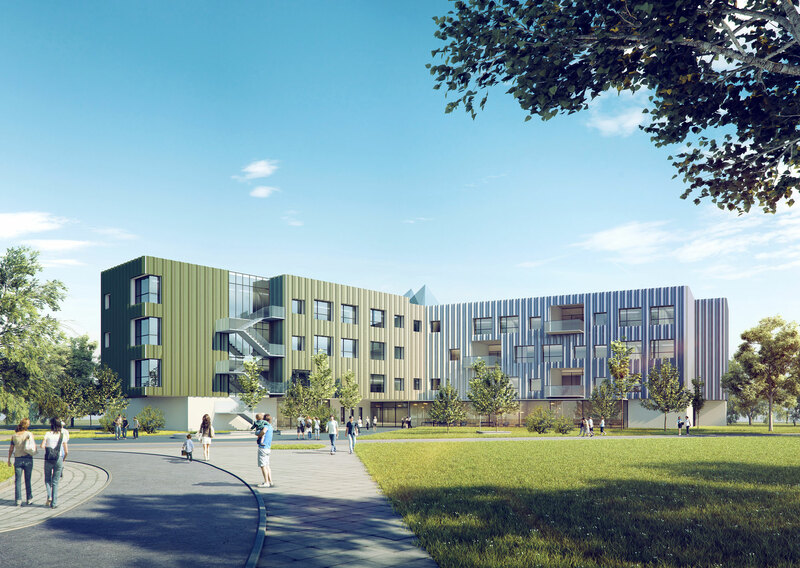 In relation to the construction we are committed to the use of materials that guarantee maximum durability and maintenance, such as prefabricated concrete panels with colours that mimic the surrounding buildings for the façade. 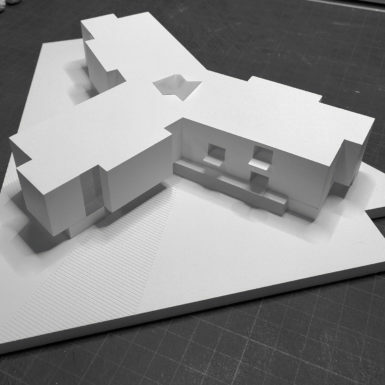 For the design of the windows, we have considered to avoid direct sunshine by projecting passive systems (“brise soleil”) to the south with orientable slats in order to regulate natural light. The interior finishes correspond to those used in educational buildings that guarantee the maximum durability and the least possible maintenance. 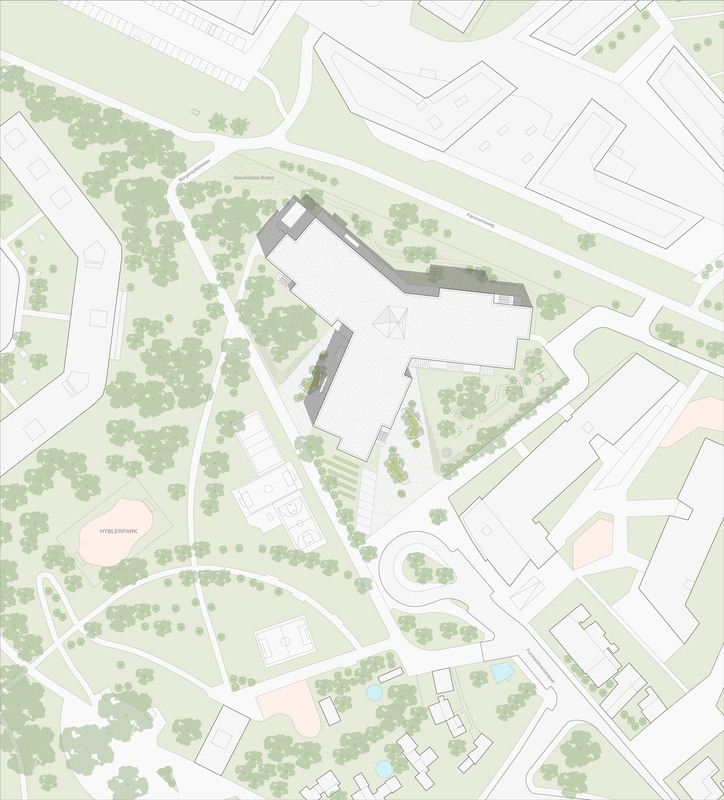 Our proposal for the new School of the Bürgerspitalwiese in Vienna adapts to the inmediate context of the open block architecture and the Hyblerpark, through an autonomous building surrounded by a large green surface. 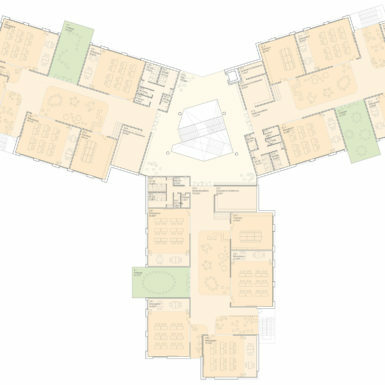 The radial form of the new school suits the program of a school divided by clusters. Finally, by increasingthe green surface inside the plot, we expand the Hyblerpark from the South towards the future Zentralpark to the North.